"OEB 2015 explores the impact of AI on education" inform ICWE Press Service. Toby Walsh will be speaking in the Friday Plenary, Tomorrow’s New World, at this year’s OEB, December 2 – 4, 2015. Over the past 21 years, OEB, the global cross-sector conference on technology-supported learning and training, has attained international esteem by presenting eminent experts whose strength lies in identifying new trends in learning and technology. At this year’s event, which opened today with more than 2000 participants from over 90 countries, AI and robotics will be put in the spotlight. World-renowned industry experts will demonstrate and discuss the opportunities presented by these fast-evolving technologies - and their implications. “We’re seeing MOOCs and intelligent tutoring systems all start to replace some aspects of teaching,” explains Walsh, keynote speaker at OEB 2015 (Friday, December 4). He says that in “well-defined domains like maths”, it is already possible to bring AI, in the form of tutoring systems, into the classroom. In addition to the STEM (Science, Technology, Engineering, and Mathematics) subjects, the realm most commonly associated with AI, researchers and developers are experimenting with how it can be used in artistic contexts such as music and dance. On OEB’s Spotlight Stage, which will play host to creative thinkers and innovators, AI pioneer Dr Luc Steels of the Vrije Universiteit Brussel presented the results of a three-year project in which he created a “smarter” MOOC for learning music using artificial intelligence. Over a period spanning more than two decades, OEB has earned - and sustained - the reputation of being an education conference that is widely recognised as one of the world’s most exciting, challenging, and inspirational. Over the next two days, the future of learning will be explored in over 100 parallel sessions, presented in a range of formats including workshops, plenaries, discussions, debates, labs, demonstrations, and performances. Furthermore, the expansive exhibition area will feature 79 international edtech providers, ranging from established market leaders to emerging start-ups. I like the way you share information! 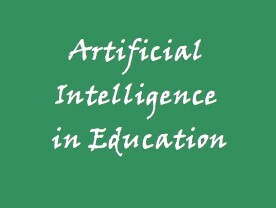 http://bigessaywriter.com/blog/artificial-intelligence-impact-on-education has some info about artificial intelligence and its influence on education! Thank you for dropping by and thanks for the link.